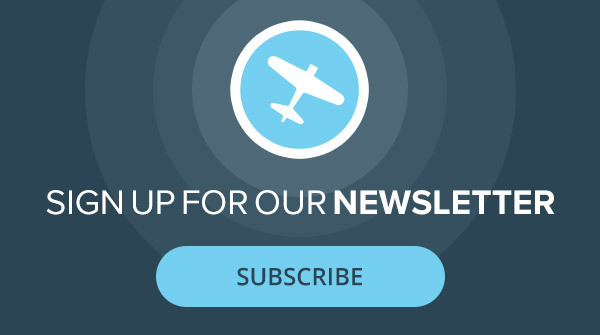 This "After the Accident" article explores CFIT (Controlled Flight Into Terrain). Why do pilots continue flying into mountainsides with the airplane fully under control? The term controlled flight into terrain (CFIT) puts an objective and rather cold label on a type of accident which has defied prevention. For example, I was going through some old Civil Aeronautics Board documents and noticed that on March 1, 1938, a TWA DC-2 en route from San Francisco to Winslow, Arizona, crashed into a mountain in Yosemite National Park near Wawona, California. All nine on board were killed. The DC-2 departed visually but it soon entered instrument conditions and the weather kept deteriorating. The pilot elected to divert to Fresno but apparently became confused about his position in relation to the Fresno Radio Range. The airplane's wreckage was located about three months later about 200 feet below the summit of the mountain. It's not as if we don't have better charts and moving maps and VOR and GPS and RNAV and other technology which the pilot of that DC-2 couldn't imagine. Fast forward to April of this year and aviation seems to be still stuck where it was 80 years ago. April is when the NTSB released its report on a Part 135 CFIT accident along with Safety Recommendations which included a call for better training of Part 135 pilots in CFIT accident avoidance. A crash scene photo from Ravn Connect flight 3153. 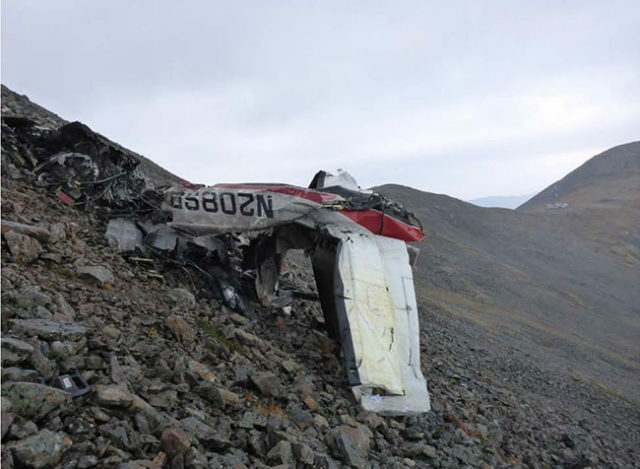 It was on October 2, 2016, at about 11:57 a.m. that Ravn Connect flight 3153, operated by Hageland Aviation Services, Inc., of Anchorage, Alaska, flew into steep mountainous terrain about 10 miles northwest of the Togiak Airport (PATG), Togiak, Alaska. The Part 135 flight was operating under VFR. There were two pilots and one passenger; all were killed. The airplane was a Cessna 208B Grand Caravan. The 1995 turboprop was powered by a Pratt & Whitney PT6A-114A engine. The Cessna 208B could be configured with two pilot seats and as many as eight passenger seats depending on the mission and whether it was for passengers, cargo or a mix. The airplane could be flown by one pilot, but Hageland often had a second-in-command on board. The airplane had accumulated 20,562 hours total time, and the next maintenance/inspection was due at 20,600 hours. It was being flown with its ADS-B system inoperative, and the repair had been deferred since ADS-B wasn't required by the airplane's minimum equipment list. The airplane had a Garmin GNS 430W and a Bendix/King (Honeywell) KLN 89B for GPS navigation, a Garmin GMX 200 multifunction display (MFD), a Bendix/King (Honeywell) KGP 560 general aviation enhanced ground proximity warning system (GA-EGPWS) that provided terrain awareness and warning system (TAWS) capabilities, and a MidContinent MD41-1200-series terrain awareness annunciation control unit. The GMX 200 MFD had a custom map function, which used shades of green, brown, and blue to depict terrain and water. Traffic information could also be displayed on the custom map page. The terrain function would show the pilot a terrain map related to what was around the airplane’s position. Yellow depicted terrain that was within 1,000 feet below the airplane’s altitude, and red depicted terrain 100 feet below and well above the airplane’s altitude. The MFD relied on an internal terrain database. The airplane met its requirement under Part 135 to be equipped with an approved Terrain Awareness and Warning System (TAWS) by having a Bendix/King (Honeywell) KGP 560 General Aviation Enhanced Ground Proximity Warning System (GA-EGPWS). The equipment used an internal GPS receiver and terrain database to define conflicts. It could check on what was ahead of the airplane's lateral and vertical paths to provide alerts if a CFIT threat existed. If the airplane was more than 15 miles from an airport and it got within 700 feet of ground level, an alert would go off. The system would provide an alert if the airplane was with a minute of hitting terrain ahead and more intense alerts when the airplane was about 30 seconds from terrain. When using the custom map or most other functions of the GMX 200, a terrain thumbnail would appear in the upper left corner of the display. A white advisory flag would appear when the airplane would be within 100 feet of a terrain hazard within about 2 minutes of flight in any direction. The white terrain advisory flag would flash for about 10 seconds then turn solid as long as the advisory remained valid. Lights would appear on the annunciation control unit on the top left side of the instrument panel. An amber light meant caution; a red light indicated a terrain warning. The terrain awareness annunciation control unit also provided a terrain inhibit (TERR INHB) switch that put the TAWS computer in standby mode. When the pilot pushed the switch, a white TERR INHB light would come on and remain on until the pilot pushed the switch again to again allow the alerts. At the time of the accident, Hageland employed about 120 pilots and operated 56 airplanes based at various airports throughout Alaska. The company operated about 55,000 flights a year. More than two-thirds its destinations could not support Part 135 IFR operations. Hageland pilots typically worked 15 days followed by 15 days off. When on duty, each pilot normally had a 14-hour duty day. A pilot normally had 8 hours maximum flight time, but that could be expanded to 10 hours if a second-in-command was along. Flight 3153 consisted of five scheduled segments, and the accident occurred during the third segment. Before the first segment, the pilot-in-command and the airline's operational control agent assigned to the flight reviewed the available weather information and completed a risk assessment that identified no hazards requiring management-level approval to proceed. The first segment departed Bethel Airport, Bethel, Alaska, about 9:27 a.m., and arrived at PATG at 10:29. The second segment departed PATG at 10:44 and arrived at Quinhagak Airport (PAQH), Quinhagak, Alaska, at 11:25. The flight’s altitude for the second segment was about 4,500 feet MSL. While at PAQH, the crewmembers were on the ground for about 8 minutes. They unloaded cargo, boarded the passenger, and departed on the third segment for PATG. According to flight tracking data from a commercial source, the accident flight proceeded southeast along a generally direct route toward PATG at about 1,000 feet MSL. The airplane’s last recorded location, at 11:53, was about 19 nm northwest of PATG at an altitude of 1,043 feet MSL. A second Hageland flight crew in a Cessna 208B departed PAQH about 2 minutes after the accident flight. According to commercial and ADS-B data, they started out flying the same route taken by the accident airplane. At 11:56, as the second flight approached the mountainous terrain, it changed heading more toward the south, which allowed it to remain over lower terrain than did the accident flight. According to the safety pilot on the second flight, they decided to change course to avoid clouds and follow a route that looked clearer. The pilot-in-command said he changed course when he saw valley fog and the potential for rain. The safety pilot stated that the clouds over the route the accident flight took were changing. The pilot-in-command said he did not see the accident airplane while in the mountains and could not recall hearing any specific radio communications from the accident pilot. Ravn Connect Flight 3153 ended in a tragic crash. When the second airplane arrived at PATG at about 12:16, and the pilots noted that the first airplane was not there. About 12:14, the Air Force Rescue Coordination Center (AFRCC) notified Hageland's director of operations that about 6 minutes earlier it received a 406MHz emergency locator transmitter (ELT) signal from the accident airplane. At about 12:31, the pilots of the first company airplane that had landed at PATG took off in search of the accident airplane. Clouds obscured the mountain from which the ELT signal was coming and they couldn't spot the wreckage. At about 2:30 p.m., an Alaska State Troopers helicopter flew in from Dillingham, and started to search. By about 4:30, the weather had lifted sufficiently for the troopers to spot the wreckage. Other troopers were able to get there on the ground about an hour later. The initial impact point contained scrape marks and pieces of the airplane's belly cargo pod. They were at an elevation of about 2,300 feet MSL on the northwest side of a steep, rock-covered ridge about 9 nm southeast of the airplane’s last position shown by the commercial tracking service. 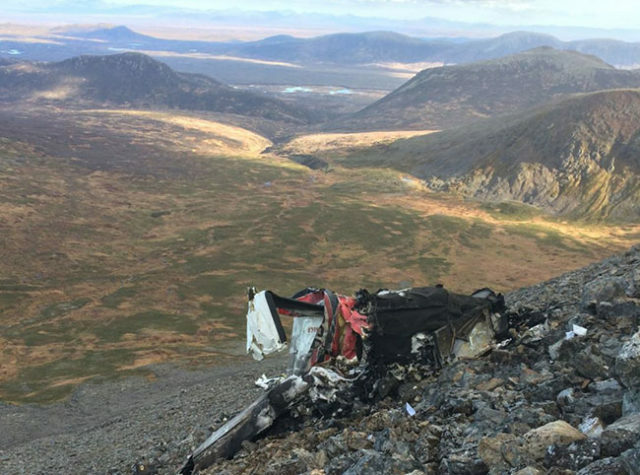 The main wreckage was located on the southeast side of the ridge. It was at an elevation of about 1,500 feet, and the right wing was found about 200 feet below the main wreckage. The engine was separated from the airframe and showed severe impact damage. Disassembly provided evidence that it was producing power at impact and the propeller showed evidence it was turning under power at impact. The vertical speed indicator (VSI) from the left side of the cockpit had a needle mark indicating the airplane was climbing at 2,500 feet per minute when impact occurred. The airplane’s terrain awareness annunciation control unit was badly damaged, but remains were recovered for laboratory examination. X-ray computed tomography images revealed that the inhibit switch on the unit was not engaged as found. This and the VSI climb indication might indicate that if the pilots had inhibited terrain warning system alerts early in the flight to stop nuisance warnings due to their being at low altitude, the system had been uninhibited shortly before impact. But, the NTSB pointed out that it did not have cockpit voice or image recordings which might have shed light on what actions the the pilots did or did not take during the flight. The accident pilot was 43 years old. He held a commercial certificate with airplane single-engine, multi-engine land, and instrument ratings. He also held a flight instructor certificate. His FAA second-class airman medical certificate was current. At the time of the accident, the company recorded him having 6,465 hours, with 765 in the Cessna 208B. He had been employed by Hageland Aviation since November 2, 2015. His recurrent training included crew resource management (CRM) and CFIT-avoidance ground and simulator training. Records for his CFIT-avoidance flight simulator training indicated he performed the specified escape maneuvers with no difficulties. Hageland records show that the pilot had flown between PAQH and PATG a total of 26 times in the preceding 11 months. According to the pilot’s wife, after a few of his friends died in crashes, he became even more safety-conscious and did not take any chances. The pilot lived in Montana with his wife and was based in Bethel where he lived in a pilot dorm. Hageland pilots worked 2-weeks-on, 2-weeks-off schedules. He commuted by commercial carrier from Bozeman to Bethel. The second-in-command, age 29, held a commercial certificate with airplane single-engine land and instrument ratings. His second-class FAA medical was current. He had 273 hours with 84 in Cessna 208B aircraft. This pilot's girlfriend told investigators he described his flying as like the “wild west,” flying in low visibility and below minimums. She said he told a friend that he would agree with what the captain of the flight wanted to do. The pilot and the girlfriend lived in Anchorage. An automated weather observing station was located at PATG. Field elevation is 18 feet MSL and it is about 10 nm southeast of the accident location. The 11:56 observation was: calm wind; visibility 7 miles in light rain; scattered clouds at 3,900 feet, overcast at 4,700 feet AGL; temperature 7 degrees C.; dew point temperature 6 degrees C.; altimeter 29.88. Rain began at 11:32. Honeywell representatives developed GA-EGPWS simulations for the flight using an estimated cruise altitude of 1,000 feet MSL and the flight track as plotted from commercial data. The estimated terrain clearances were between 500 and 700 feet. The simulation assumed that the airplane entered a climb after the last known data point and achieved and maintained an altitude of 2,300 feet MSL beginning 3 nm from the initial impact point. Under the simulation, the terrain warning equipment began providing continuous “CAUTION TERRAIN, CAUTION TERRAIN” alerts 46 seconds before impact. Then, 36 seconds before impact, the pilots would have heard “TERRAIN, TERRAIN, PULL UP” with “PULL UP” repeated until impact. The NTSB said the probable cause was the flight crew’s decision to continue VFR flight into deteriorating visibility and their failure to perform an immediate escape maneuver after entry into instrument conditions, which resulted in controlled flight into terrain. Contributing to the accident were (1) Hageland’s allowance of routine use of the terrain inhibit switch for inhibiting the terrain awareness and warning system alerts and inadequate guidance for uninhibiting the alerts, which reduced the margin of safety, particularly in deteriorating visibility; (2) Hageland’s CRM training; (3) the FAA’s failure to ensure that Hageland’s approved CRM training contained all the required elements of FAR 135.330; and (4) Hageland’s CFIT-avoidance ground training, which was not tailored to the company’s operations and did not address current CFIT-avoidance technologies. CFIT-avoidance training was not required by regulation for Part 135 airplane operations. Hageland and many other Alaska operators provided CFIT-avoidance training through participation in the Medallion Foundation, an outside organization which gave a “star” to operators using Medallion guidance to create a CFIT-avoidance program. The operators were allowed to use the “star” in their advertising. The NTSB criticized Hageland’s CRM training for not providing procedures for flight crew coordination, communication, and the division of crew duties. The Safety Board said it didn't provide flight crews with the skills to exercise good aeronautical decision-making and judgment to mitigate the risk of CFIT. It criticized the FAA for not providing proper oversight of the CRM training. That would seem to ignore the fact that the second Hageland crew flying the same route avoided a CFIT accident. While the NTSB's prevention efforts stemming from this accident were focused on Part 135, it could just as easily served as a hook for a CFIT-avoidance alert for all pilots. After all, the threat of CFIT is so ubiquitous that completely eliminating it will require moving mountains.